Let me explain as briefly as I can why this minimum wage increase is immoral. We will use data from the chart below which was cribbed from Mark Perry in this post. The average wage of people who work in the poorest 20% in the US is already near $15 ($28,417 divided by 2000 full time hours - $14.20 per hour). This is not that much lower than the hourly earnings of those in the second poorest or even the middle quintiles. So why are they poor? The biggest different is that while only 16% of the middle quintile households had no one who worked, and 31.5% of the second poorest quintile had no one who worked, of the poorest 20% of households a whopping 63% had no one who worked. Only 16.1% of poor adults had a full time job. 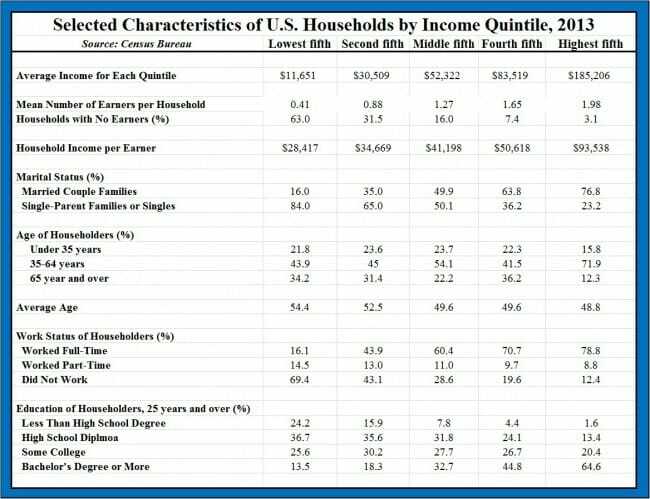 Past studies have shown that most of the benefit of the minimum wage goes to non-poor households (ie second and third earners in middle class homes). The targets Jerry Brown speaks of, parents earning the minimum wage to take care of families, are perhaps only 1/8 of minimum wage earners. MaCurdy found that less than 40% of wage increases [from a minimum wage hike] went to people earning less than twice the poverty line, and among that group, about third of them are trying to raise a family on the minimum wage. Of course, the price of a lot of stuff poor people have to buy in California is about to go up. We are going to have to raise our campground rates by 20-25% to offset the labor cost increase. But that is another story. Has anybody seen what is in this legislation? I'm still curious to see if workers who are covered under collective bargaining agreements are exempt. I thought you said you'd abandoned Cali?